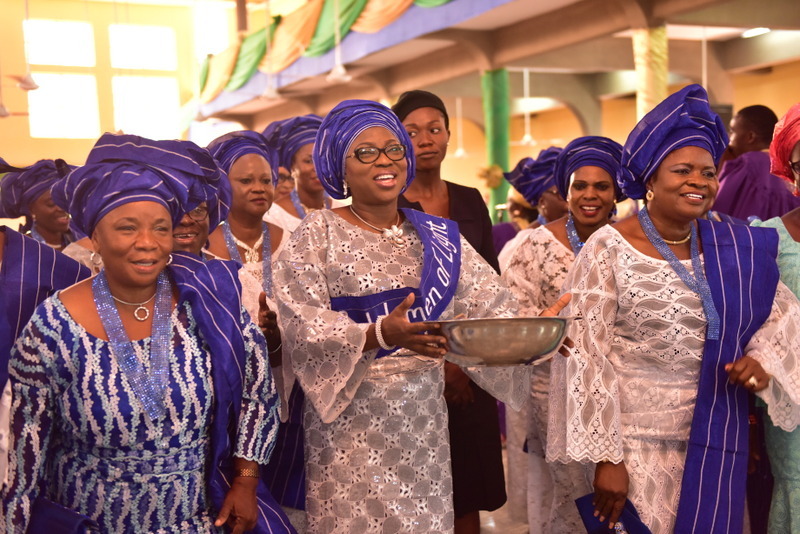 Wife of Lagos State Governor, Mrs. Bolanle Ambode, was conferred as the Grand Matron by Women of Light Fellowship, for her selfless service to the less privileged, at the 2016 Women of Light Anniversary with the theme: “Our Abode: A Christian Home not just a House”, at the Chapel of Christ the Light, Alausa, Ikeja, on Sunday, July 10, 2016. Wife of Lagos State Governor, Mrs. Bolanle Ambode with members of Women of Light Fellowship giving thanks to God, during the 2016 Women of Light Anniversary with the theme: “Our Abode: A Christian Home not just a House”, at the Chapel of Christ the Light, Alausa, Ikeja, on Sunday, July 10, 2016. 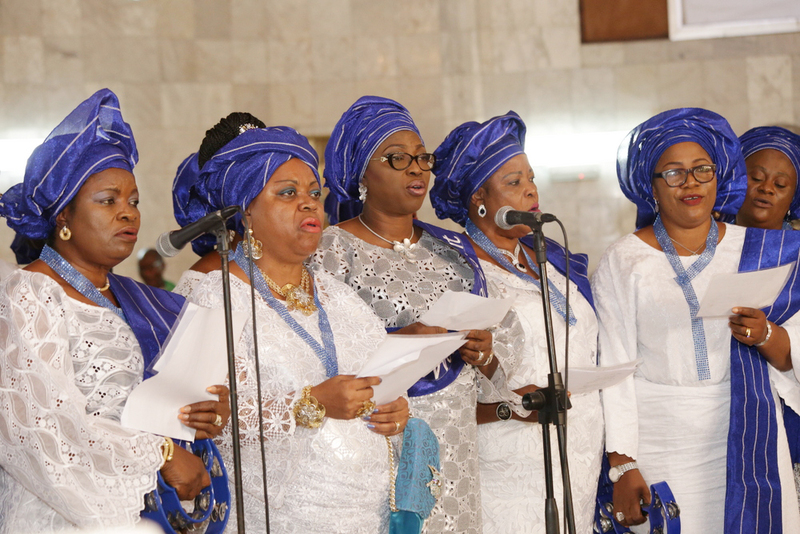 Wife of Lagos State Governor, Mrs. Bolanle Ambode with members of Women of Light Fellowship singing the Fellowship Anthem, during the 2016 Women of Light Anniversary with the theme: “Our Abode: A Christian Home not just a House”, at the Chapel of Christ the Light, Alausa, Ikeja, on Sunday, July 10, 2016. 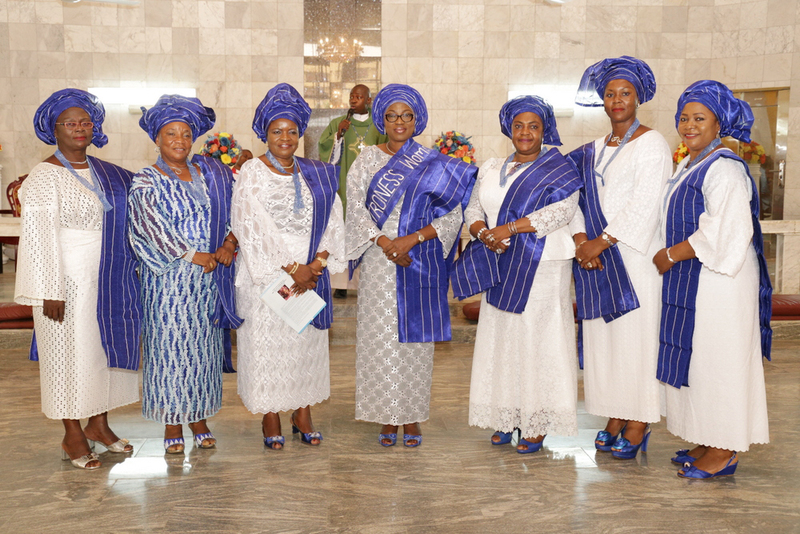 Wife of Lagos State Governor, Mrs. Bolanle Ambode (middle) with members of Women of Light Fellowship, during the 2016 Women of Light Anniversary with the theme: “Our Abode: A Christian Home not just a House”, at the Chapel of Christ the Light, Alausa, Ikeja, on Sunday, July 10, 2016. 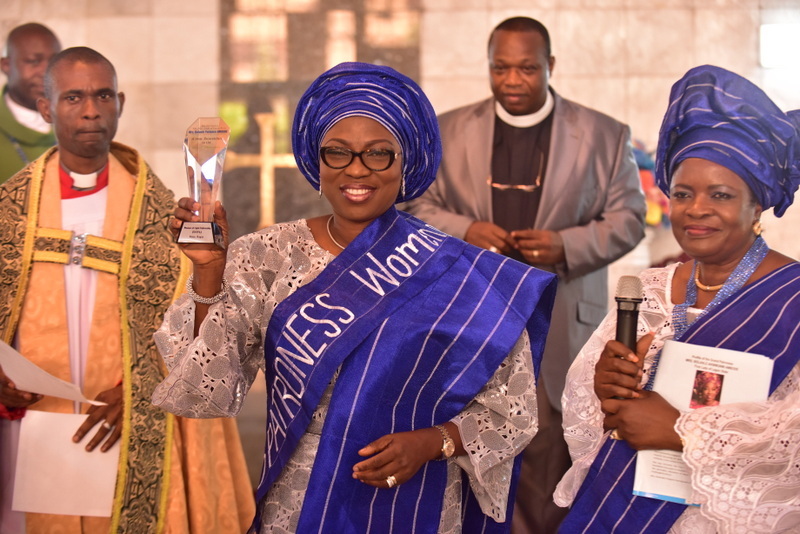 Wife of Lagos State Governor, Mrs. Bolanle Ambode displaying her Award, during her conferment as the Grand Matron by Women of Light Fellowship, for her selfless service to the less privileged, at the 2016 Women of Light Anniversary with the theme: “Our Abode: A Christian Home not just a House”, at the Chapel of Christ the Light, Alausa, Ikeja, on Sunday, July 10, 2016. 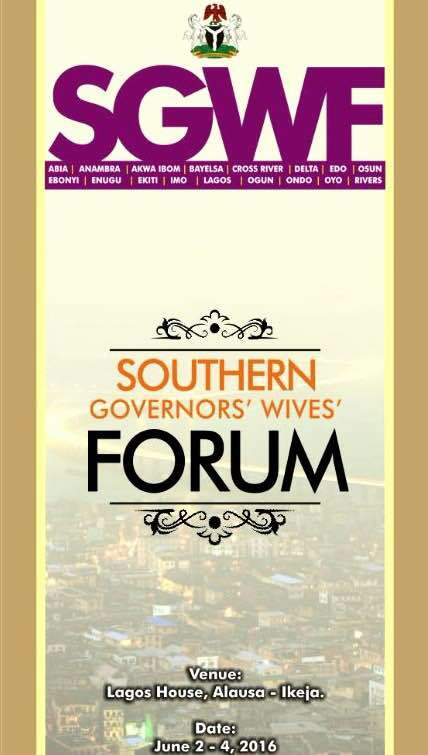 Wife of the Governor of Lagos State, Her Excellency, Mrs Bolanle Ambode, sincerely expresses her appreciation to the Southern Governors’ Wives’ Forum under the aegis of ‘SGWF’ during the second edition of their meeting held in Lagos from 2 – 4 June, 2016. R-L: Wife of Lagos State Governor, Mrs. Bolanle Ambode (2nd right); Wife of Osun State Governor, Alhaja Sherifat Aregbesola; Ogun State Governor, Senator Ibikunle Amosun; Wife of the President, Hajiya Aisha Buhari; Celebrant & Wife of Ogun State Governor, Mrs. Olufunso Amosun and Wife of the Vice President, Mr.s Dolapo Osinbajo during a Green Education For The Youth (GEFTY) disclosure to commemorate the 50th Birthday of Mrs. Amosun, at the Hubert Ogunde Hall, Cultural Centre, Abeokuta, Ogun State, on Monday, May 02, 2016. 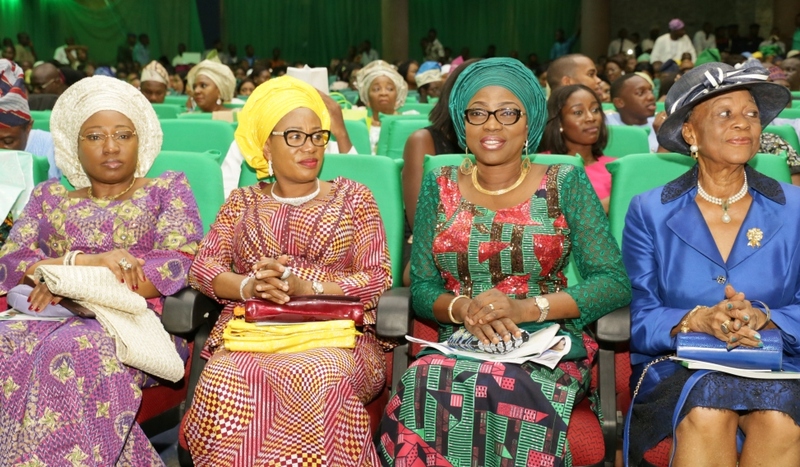 R-L: Wife of Lagos State Governor, Mrs. Bolanle Ambode; Wife of Osun State Governor, Alhaja Sherifat Aregbesola; Celebrant & Wife of Ogun State Governor, Mrs. Olufunso Amosun and Wife of the Minister of Solid Minerals, Erelu Bisi Fayemi during a Green Education For The Youth (GEFTY) disclosure to commemorate the 50th Birthday of Mrs. Amosun, at the Hubert Ogunde Hall, Cultural Centre, Abeokuta, Ogun State, on Monday, May 02, 2016. 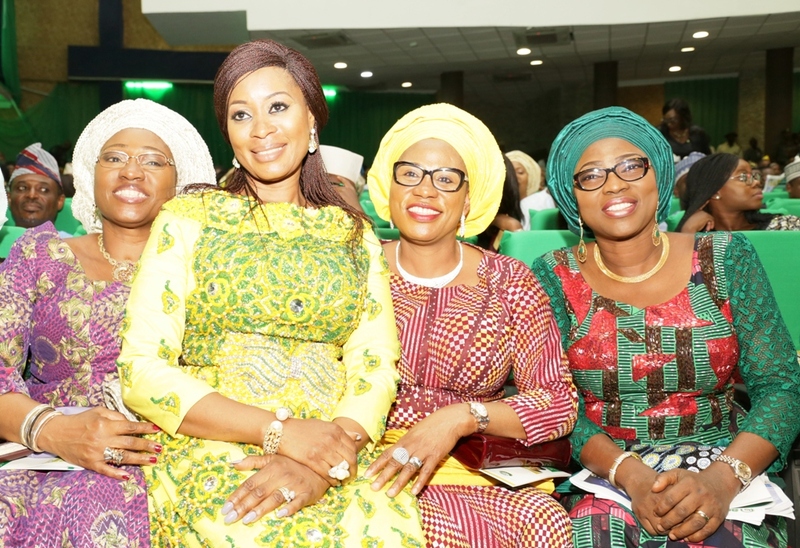 Wife of Lagos State Governor, Mrs. Bolanle Ambode (2nd right); Mrs. Folake Sholanke, SAN (right); Wife of Osun State Governor, Alhaja Sherifat Aregbesola; (2nd left) and Wife of the Minister of Solid Minerals, Erelu Bisi Fayemi (left), during a Green Education For The Youth (GEFTY) disclosure to commemorate the 50th Birthday of Mrs. Amosun, at the Hubert Ogunde Hall, Cultural Centre, Abeokuta, Ogun State, on Monday, May 02, 2016. 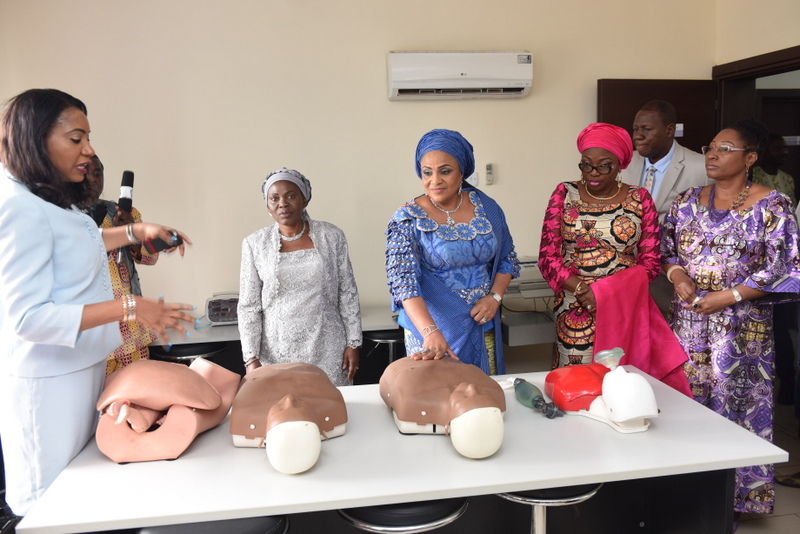 R-L: Wife of Lagos State Governor, Mrs. Bolanle Ambode (3rd right); Wife of Osun State Governor, Alhaja Sherifat Aregbesola; Wife of Edo State Governor, Mrs. Iara Oshiomole; Wife of Delta State Governor, Dame Edith Okowa; Wife of Ogun State Governor, Mrs. Olufunso Amosun; Wife of Imo State Governor, Mrs. Nkechi Okorocha; Wife of Enugu State Governor, Mrs. Monica Ugwuanyi; Wife of Abia State Governor, Mrs. Nkechi Ikeapzu and Representative, Wife of Kwara State Governor, Dr. Asiat Ayinke Saka during the Flag-off of the Future Assured Initiative (Free Health Screening for Women) initiated by the Wife of the President, Hajiya Aisha Buhari, at the Loyola College, Ibadan, Oyo State on Thursday, April 28, 2016. 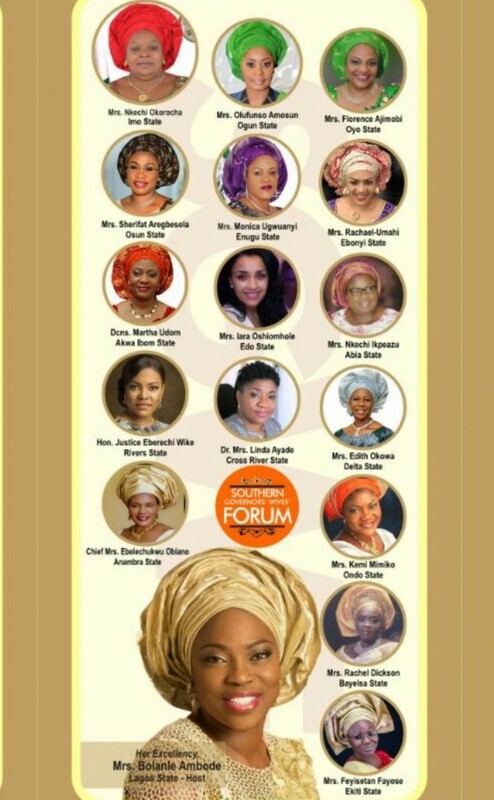 Wife of Lagos State Governor, Mrs. Bolanle Ambode (2nd right); APC South-West Women Leader, Chief (Mrs.) Kemi Nelson (right); Wife of Delta State Governor, Dame Edith Okowa(3rd right); Wife of Ogun State Governor, Mrs. Olufunso Amosun (4th right); Wife of Osun State Governor, Alhaja Sherifat Aregbesola (3rd left); and Wife of the President, Hajiya Aisha Buhari during the Flag-off of Future Assured Initiative (Free Health Screening for Women) initiated by the Wife of the President, at the Loyola College, Ibadan, Oyo State on Thursday, April 28, 2016. Wife of Lagos State Governor, Mrs. Bolanle Ambode (middle) flanked by Wife of Edo State Governor, Mrs. Iara Oshiomole (right) and Wife of Delta State Governor, Dame Edith Okowa(left) during the Flag-off of Future Assured Initiative (Free Health Screening for Women) initiated by the Wife of the President, Hajiya Aisha Buhari, at the Loyola College, Ibadan, Oyo State on Thursday, April 28, 2016. 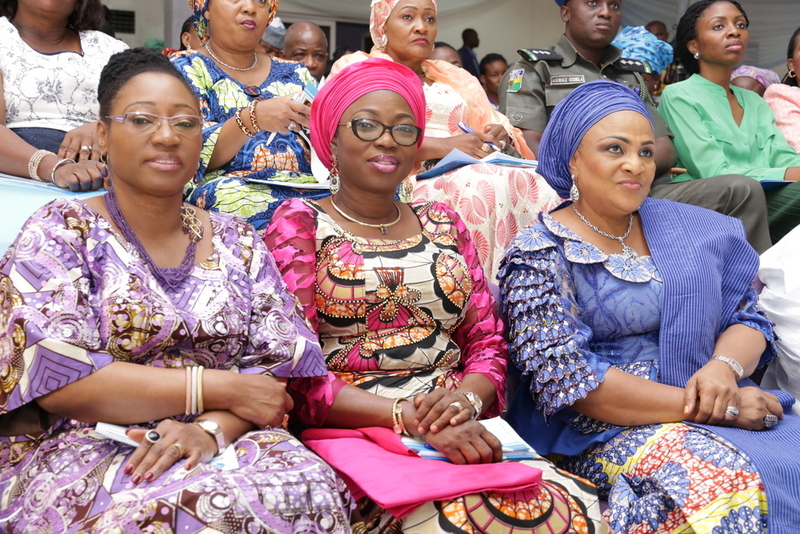 R-L: Wife of Lagos State Governor, Mrs. Bolanle Ambode; Wife of Delta State Governor, Dame Edith Okowa; Wife of Ogun State Governor, Mrs. Olufunso Amosun; Wife of Imo State Governor, Mrs. Nkechi Okorocha during the Flag-off of Future Assured Initiative (Free Health Screening for Women) initiated by the Wife of the President, Hajiya Aisha Buhari, at the Loyola College, Ibadan, Oyo State on Thursday, April 28, 2016.